The words “winter salad” don’t stir up the same emotions or lack of emotion as the words “summer soup”. I get as excited about summer soup as a flat line on a heart monitor. The patient died from boredom. I like my potatoes in potato salad in the summer, not in Vichyssoise. I’ll have my fruit in its own skin or on top of a Pavlova in the summer, thank you. Please don’t throw my smoothie into a bowl with a dollop of crème fraiche—not that I order many smoothies either. Give me my peas right off the vine, zipped from their shells, still warm from the sun. As far as I’m concerned, cold pea soup belongs in the Exorcist. It’s not that I haven’t tried to love summer soup, I have. It’s often the amuse bouche at upscale restaurants in the summer, so I’ve tried many of them. They are not awful, but they leave me cold, except for gazpacho, but definitely not pureed. I’ll take mine straight up with chunks is my motto. On the other hand, the words “winter salad” scream, “Game On!” because there’s so much room to be creative with root veggies, citrus fruits, and hearty winter greens. 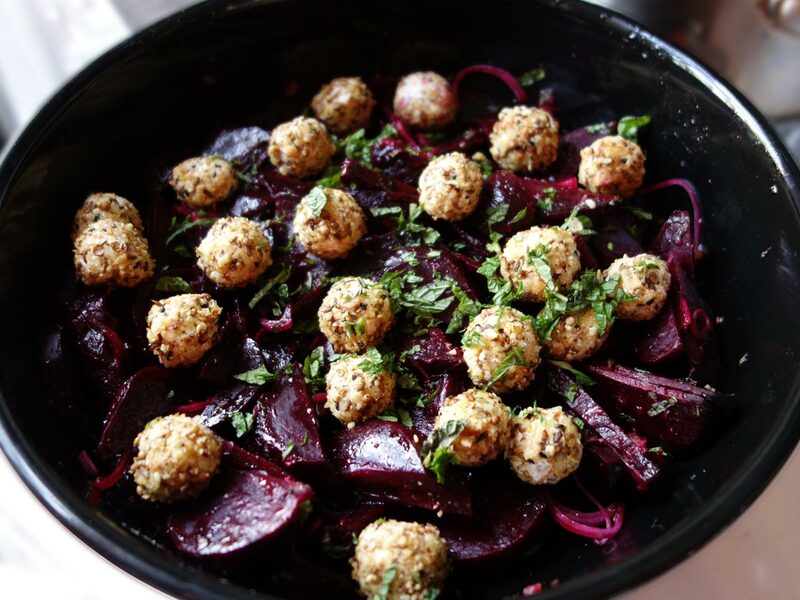 I have to add more winter salads to the blog, but there is a stunning Roasted Beet Salad With Dukkah Crusted Labne Balls & Preserved Lemon Dressing I made for a winter brunch party a few years ago. 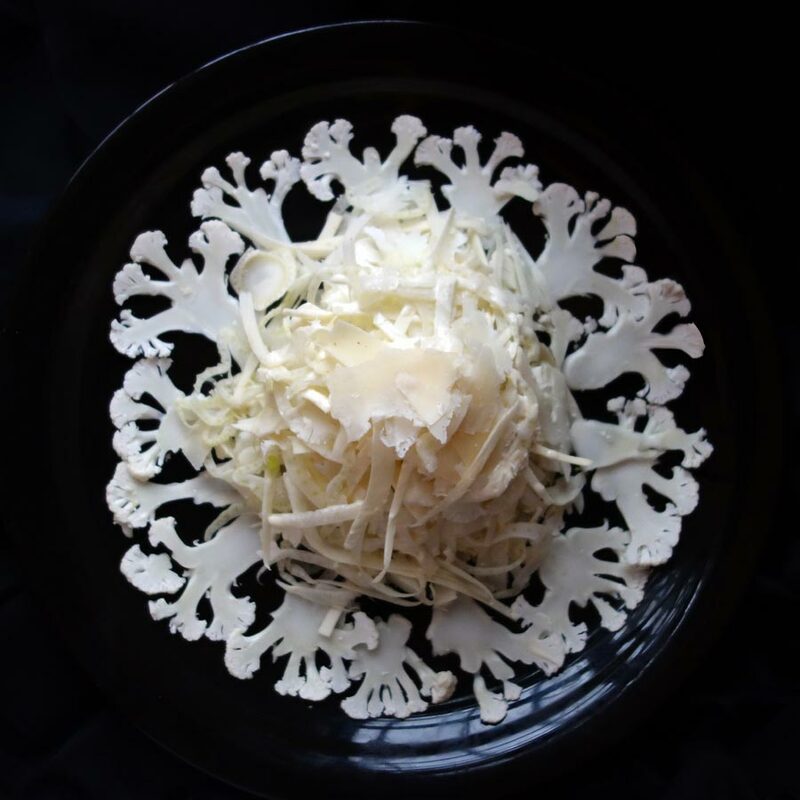 Check out my Winter White Salad with Parmesan Dressing. We drove from New York to Montreal on the day after Christmas, in 2012. It was a fairly easy six-hour ride and luckily we only hit snow when we reached Canada. Montreal looked stunning dressed in white. We stayed at the Montreal Marriott Château Champlain, which is not only in the heart of downtown, but on top of the subway and directly linked to the Underground City. So you rarely have to actually go outside. However, we got in late and it was the day after Christmas so most of Montreal was closed. We were starving and our options were few. As pretty as freshly fallen snow looks, it’s a pain to drive in, especially in an unfamiliar city. 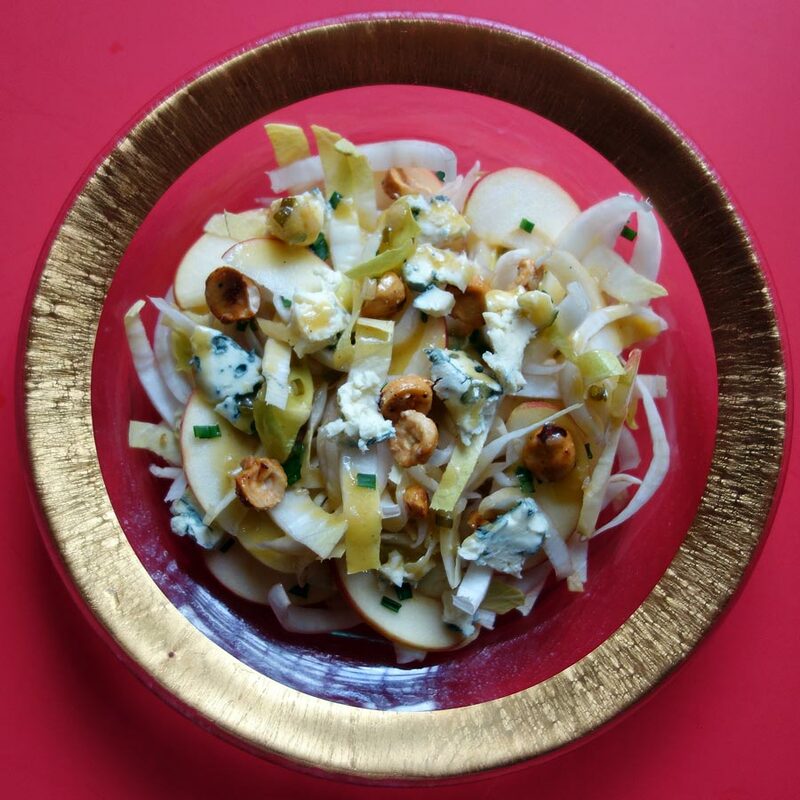 We wound up trudging through the snow to the Dominion Square Tavern and having a version of this Endive Salad with Apples, Blue Cheese and Candied Hazelnuts with our meal of moules frites and braised beef. I think of it as a winter salad because I had it for this first time in the snow. The maple vinaigrette, apples, and candied nuts are cozy weather foods, but the endives grow all year round. It was still on the menu when we went back in August of 2014 and just as tasty, but I did miss the snow a little. I first tasted this maple vinaigrette on a endive salad at Dominion Tavern in Montreal in 2011. I never forgot it. It’s perfect for every day. Mix maple syrup, shallots, mustard vinegar and olive oil in a jar. Put on the lid and shake until the dressing is emulsified. Add salt and pepper to taste. Use real maple syrup and the best Dijon mustard you can find. I like Laurent Du Clos brand of mustard. It has a bite! I like to add candied nuts on top of desserts, salads, a cheese board, and more. This is a quick way to make them. Place nuts a cold medium cast iron skillet. Turn on medium heat. Stir nuts constantly with a silicone or heatproof spatula, until they are lightly toasted. The whole nuts will take longer. Sprinkle in the sugar continuing to stir the mixture until it melts and begins to coat the nuts. You will see beads of caramel in the pan. Add the water and continue to stir to coat the nuts and evaporate the water. Stop cooking at desired consistency. Sprinkle with salt, if desired. For cake garnishing, salads or cheeseboards I like the nuts to be drier. For sundaes, I like the nuts to be wetter. Depending on how I’m using them I may add some cream to the nuts to make a creamy, nutty caramel sauce. To further dry the nuts, I put them in a 300 ° oven for 5-10 minutes. 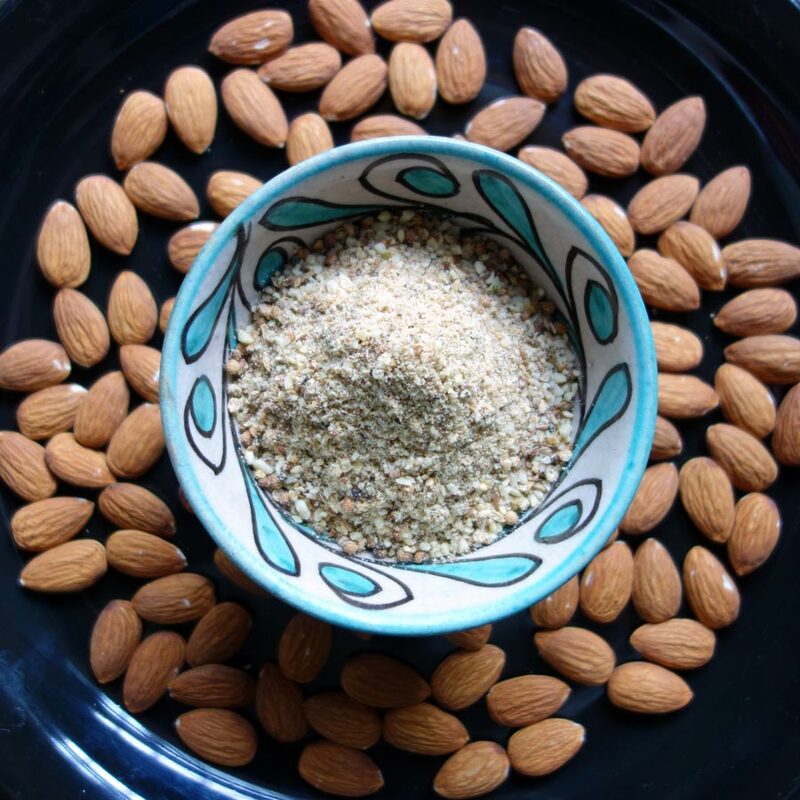 Serve dukkah with sliced bread and olive oil. Roll a log of goat cheese in it and serve with crackers. Also delicious for crusting fish or chicken. Put all ingredients, except cayenne pepper, in heavy skillet and toast gently. Shake the pan or stir spices to toast them evenly, being careful not to burn them. You want them to release their aroma. I used the sesame seeds as an indicator and let them get just light brown since the mixture will continue cooking when you remove it from the heat. Once it is lightly toasted, pour ingredients into the food processor fitted with the steel knife or another dish to stop them cooking. Add cayenne pepper and cool. Process mixture by pulsing until the ingredients are crushed like coarse bread crumbs or grind them with a mortar and pestle. Dip salmon fillet in olive oil. Place salmon, skin side down, in a frying pan or baking tray and carefully put the dukkah on top. Drizzle or spray with more olive oil. Put pan over a hot flame or in a 400° oven; cook for 5 minutes and then broil on top until dukkah is browned.